During the early 1600's, many Dutch imigrants began to settle in Great Kills. By the 1660's, a Treaty was signed, stating that the English would now possess New Amsterdam, which is now known as New York City. The Great Kills area was separated in two; Clarendon along the shoreline, with Newton above it. Later, the two were united and named "Giffords", after Daniel Gifford, a local commissioner. By the late 19th centur y, the area was incorporated and given its current name. The name Great Kills was the result of the Anglicization of the words "Groote Kell" which, from Dutch, may translate to "many creeks". For centuries, Great Kills has been known greatly for its resources. It all started with the Native Americans, who resided in the area for quite some time before the Europeans usurped them. They would use the plants and animals for food, shelter, medicine, and other needs. Being so close to the water, it was easy to harvest oysters, which were abundant during the 19th century. During the middle of this century, many of Great Kills' residents began to fish in the waters by Great Kills Park. In 1860, John J. Crooke purchased the peninsula which was in turn named "Crookes Point". In 1929, it was again purchased by the City of New York, who also purchased the surrounding area. Their plan was to develop the area into a park, but due to the Great Depression, the construction had to wait, and the park was not opened until 1949. Great Kills Park became a national park in 1973 and has since then developed into 580 acres. In Great Kills Park, you will find Nichols Great Kills Marina, which is popular among boaters and fishermen. The marina is owned and managed privately although it sits on federal property. Members of the marina have stated that it is well-maintained, the staff is very helpful, and theft is low due to the patrolling of security. Across the water, jutting out by Wiman Avenue, you will find Crescent Beach Park. Made up of about 67 acres, the beach consists of quite a few woodland, waterfront, and wetland areas along Tennyson Drive. Just as well, you have a great view of Great Kills Harbor, Raritan Bay, the Verrazano Bridge, and the skyline. Each season, the Crescent Beach Civic Association administers cleanups of the beach. They also host block parties for neighborhood residents each year. To the north of Crescent Beach Park, you will find the 20-acre Seaside Wildlife Nature Park. In 1994, the area was filled with debris, abandoned cars, and garbage. With the help of the City of New York Department of Parks, the Department of Sanitation, the Department of Environmental Protection, and many others, the wasteland soon became a beautiful park. Next to the entrance, you will find a 24-foot gazebo, which is accompanied by a new path built in 2009, equipped with benches, a drinking fountain, and a boardwalk. One year later, a playground was constructed in the park. Not far from the Seaside Wildlife Nature Park, you have the Port Regalle Condominium Complex (Pictured Left). These waterfront condominiums overlook Great Kills Harbor out to the Raritan Bay. These south Florida style condos are dressed up in Flamingo Pink topped with red Spanish roofs and fit the part well with a marina attached to the complex. These condominiums are primarily two and three bedroom units. Some of these condos exceed 1500 square feet. The condo units having a southern exposure overlook the water and are priced higher as a result. Each unit is assigned parking for each. 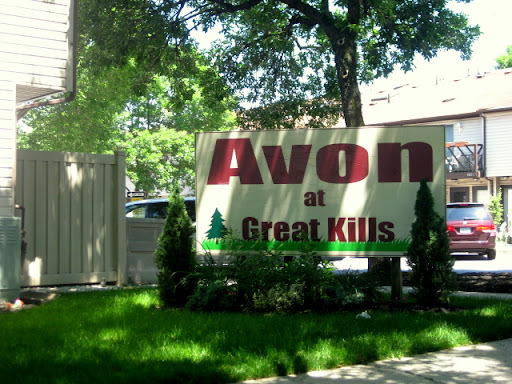 Great Kills is home to many condominium complexes, including the Avon Condo development and 360 Barlow Ave Complex among others. Just northeast of the Seaside Wildlife Nature Park is Mansion Marina, located on Mansion Avenue. Not only is the marina great for boating and fishing; it is also surrounded by many great places to eat. A favorite of some of the members themselves and other residents of the neighborhood is the Marina CafÃ©, Coles Dockside and Fiore Di Mare, which is right by the Mansion Marina, and Richmond County Yacht club. As you move down Mansion Ave., you will find the Great Kills Yacht Club sitting innocuously at the end of the street. In addition to the parks and condos you, of course, have your schools in the area. The public schools which serve the area are P.S. 8 on Lindenwood Road and P.S. 32 on Elverton Avenue. The intermediate school in the area is I.S. 24, which is located on Cleveland Avenue. The high schools which serve Great Kills are Tottenville High School in Huguenot and Susan E. Wagner High School in Seaview. Just as well, you have your Roman Catholic schools: St. Francis, which accepts grades k-12 and is located on Amboy Road, and St. Clare's, on Nelson Ave., which accepts grades k-8 and is located on Lindenwood Road. Along with the other neighborhoods in the South Shore, Great Kills has its own Railroad Station. The station is located at Giffords Lane and Brower Court, with stairs and an overpass which leads to Brower Court and Nelson Avenue. It is also handicapped-accessible and has a park-and-ride lot. Near the Great Kills Station is a bus stop for the 54, which travels to and from West New Brighton and Eltingville via Nelson Avenue and GIffords Lane. Along Hylan Boulevard, you also have the 78, which travels to St. George or the Bricktown Mall, and the 79, which takes you to the Staten Island Mall or Bay Ridge.